Amazon.com Price: (as of 2019-04-24 18:42:49 GMT) Product prices and availability are accurate as of the date/time indicated and are subject to change. Any price and availability information displayed on Amazon.com at the time of purchase will apply to the purchase of this product. It’s Cabbie to the rescue! In Disney’s Planes: Fire & Rescue, Cabbie is on the crew with a very special mission: transport and release the smoke jumpers that fight fires. Boys will have a blast re-creating movie moments with this large-scale adventure vehicle. 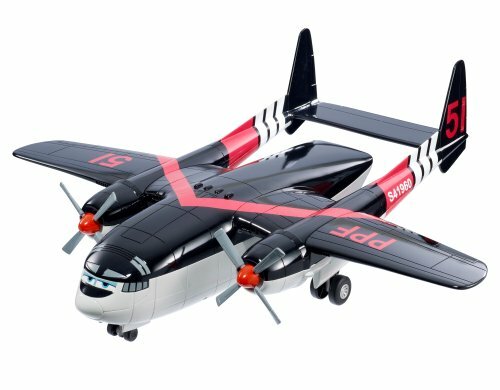 He is authentically styled with real, spinning propellers and roomy enough to carry three smoke jumpers at a time. Just open his back door to store or release the smoke jumpers at the critical moment! Kids will have high-flying, heroic fun with this Cabbie Transporter. He’s revved and ready for his next mission! Authentically styled and featuring real, spinning propellers! Kids will love re-creating high stakes scenes from the movie!